The Long March 2C rocket launched at 10:50 a.m. Tuesday, Oct. 29, 2013, Beijing time. China unexpectedly launched a Long March rocket Tuesday (Oct. 29) and put into orbit a secret military surveillance satellite likely equipped with a synthetic aperture radar to make observations through clouds and darkness. 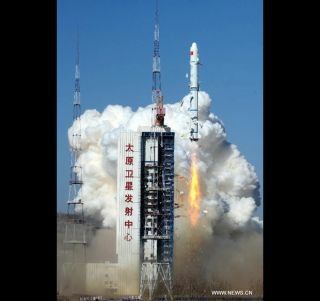 The Long March 2C rocket soared into space from the Taiyuan space center in northern China's Shanxi province at 0250 GMT Tuesday, 10:50 p.m. EDT Wednesday, or 10:50 a.m. Beijing time, China's state-run Xinhua news agency reported. The two-stage liquid-fueled launcher placed the Yaogan 18 satellite into an orbit more than 300 miles (482 kilometers) above Earth with an inclination of approximately 97 degrees, according to U.S. military tracking data. China did not announce the launch in advance, keeping with the country's usual policy of not disclosing the launch schedule for military satellites. The Xinhua news outlet, a mouthpiece for the Chinese government, said Yaogan 18 will "conduct scientific experiments, carry out land surveys, monitor crop yields and aid in preventing and reducing natural disasters." But Western analysts believe the Yaogan name is a cover for China's intelligence-gathering satellites. The circumstances of Yaogan 18's launch, including its orbit and launch vehicle, match two previous Yaogan satellites launched in April 2009 and November 2011. Independent observers of China's space program believe Yaogan 18, like the satellites launched in 2009 and 2011, hosts a synthetic aperture radar payload optimized to resolve targets on the ground through clouds and during nighttime. Tuesday's launch was the second Chinese space launch in four days and China's 10th space launch of the year. It marked the 59th launch to reach orbit worldwide in 2013.